The study described and analyzed the performances of universities in Taiwan in five systems of university rankings, including Academic Ranking of World Universities, Times Higher Education World University Rankings, National Taiwan University Ranking, QS World University Rankings and U.S. News Best Global Universities Rankings. The top four universities in Taiwan generally have consistent rankings across these five systems in 2014, namely, National Taiwan University being ranked first, National Tsing Hua University second, National Cheng Kung University third, and National Chiao Tung University fourth. Although these rankings may neither be fully objective and just in nature, nor representative of what missions or tasks Taiwan universities should accomplish, these rankings provide a reference for the relative places around the world, in which these Taiwan universities have established. Library act is the principal basis of development of all types of libraries. 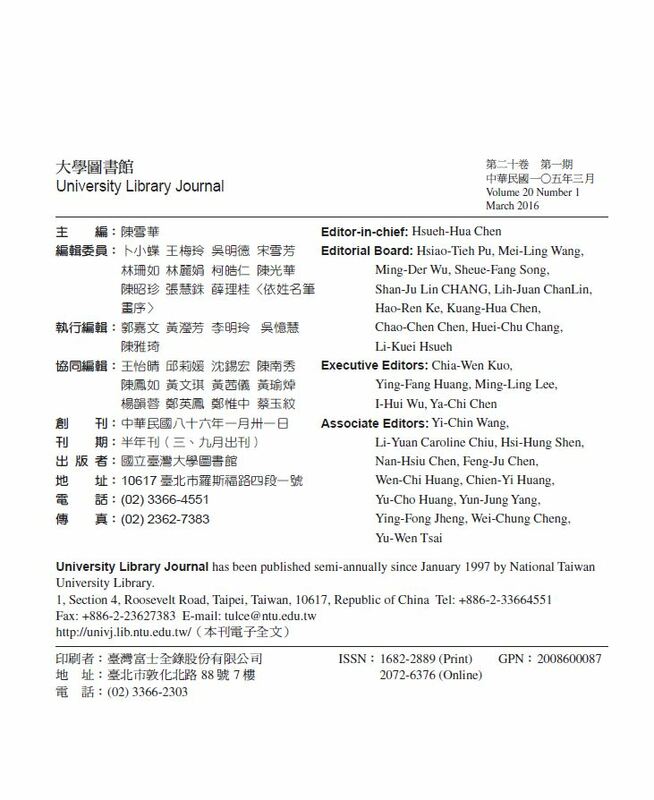 The main purpose of this article is to understand the structures and functions of the first amendment ninth clause of the Taiwan library act and then to evaluate the amendment of this clause. Finally, this paper will offer suggestions to help revised the new clause in library act. Research fronts represent areas of cutting-edge study in specific fields. They not only provide insights into current focuses and future trends, but also serve as important indicators for government policymaking with regard to technology. 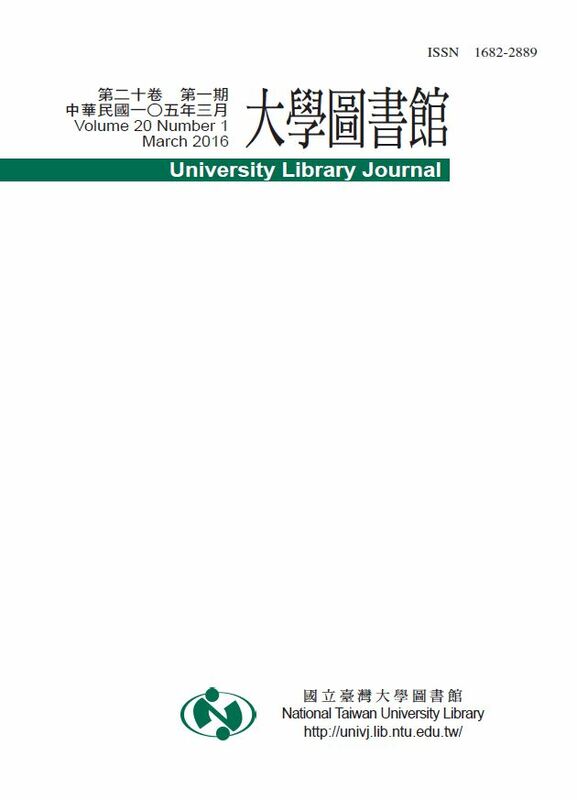 Since the concept concerning research fronts has not been quite common in library and information science in Taiwan, this study intends to briefly introduce this concept, hoping that people can have more in-depth understanding about research fronts. This paper is divided into five parts. The first part is research fronts’ meaning and its related concept. The second explores the basis to detect the research fronts. The third concerns research fronts’ related indicator. The fourth studies the empirical research related to the research fronts, with focus on using the research methods of bibliographic coupling, co-citation, and various citation analysis. Finally, this study proposes some recommendations for the future research. Undergraduate suffering from a breakup could soothe negative emotions and empower themselves by watching appropriate movies. This is an adaption of the so-called “movie therapy”. The researchers deployed semi-structured interviews to understand the emotional healing efficacy of movies for Taiwanese undergraduates with breakup problems, and part of the results of this research has been published. While former literatures had suggested the analogy between audience and characters of emotional healing materials, two interviewees of this past study had alternatively chosen movies contrast to their own sexual orientation and still underwent the experience of emotional healing. Thus, the researchers further discuss how and why the two movies help the interviewees with their emotional disturbance problems. The results reveal that, whether the setting and plot could personally induce identification, catharsis and insight from the plot and content of movies is more crucial for the interviewees. The fact that a movie focused on homo- or heterosexual relationship is less relevant. Based on the research result, as long as a movie possesses traits beneficial to emotional healing, it might remain a proper emotional healing material even the background setting is different from an audience’s personal experience. This study attempts to link the same object to its different versions through DOI, supplemented by linking different works by the same author via an author identifier, and to render specific correlation between digital objects through hierarchical FRBR relationships. The digital objects include electronic books, electronic dissertations, and electronic proceedings. The results of this study may assist libraries to establish bibliographic families within electronic resource collections and provide a reference model for using DOI resources installed on the World Wide Web to implement information organization in the future.